12 or 14 inch Wheels? | Questions about this item? Ask here. Make a selection from here if you already know which bolt pattern/offset you want. Or just Choose your Machine on next option. STI has become a household name in the ATV world. We can't hardly keep their rims on the shelves because they sell like hot cakes. We have a feeling this new HD4 will be no different. 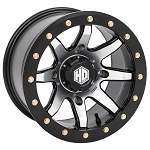 It's a classy looking rim that is extremely strong and it's available in most bolt patterns and several sizes. 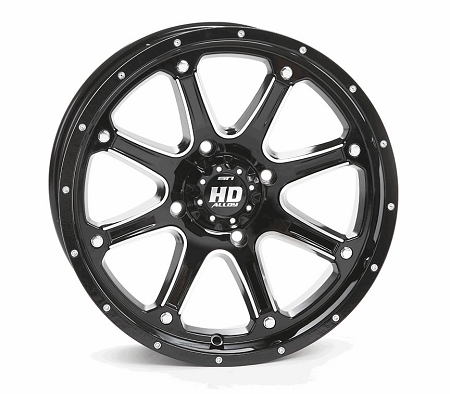 You won't believe the transformation of your ATV with a new set of STI HD4 rims. 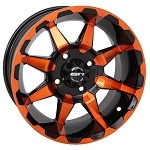 - Our STI ATV rims are sold individually. - In most cases our STI ATV wheels ship out same day! - Many offsets and bolt patterns available for most ATV/UTV applications. - Features a glossy black machined finish. - Center caps and lug nuts included with all HD4 wheels. - All STI HD wheels come with a lifetime structural warranty. Unsure About What You Need? - See our ATV Bolt Pattern Guide and Wheel Offset Guide. - Enter in your machine details and we'll make sure to send you the correct items. These wheels are super nice they came in a great package and they look really nice. The shipping was nearly overnight. The only small problem that I have had with them, is the little sticker in the center cap that says XD has popped off on two of the wheels and gotten lost, other than that I love these wheels. I recieved these wheels the next day and everything arrived as advertised. Easy to bolt on and they look good on my quad. Thanks. Q: Is all 4 wheels with the purchase? A: Our rims are sold individually. If you need 4 of them you will need to put 4 for the quantity. Was this answer helpful? 1 of 1 Customer(s) found this Answer helpful. Q: Will these fit 2005 polaris scrambler? Was this answer helpful? 0 of 0 Customer(s) found this Answer helpful. Copyright Pure Offroad. All Rights Reserved.